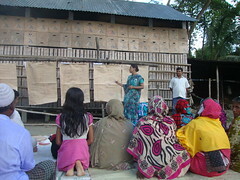 Water, Sanitation and Hygiene (WaSH) are essential for people’s in rural Bangladesh. 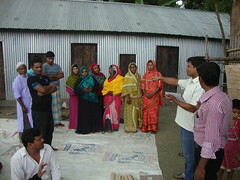 AMRF is implementing a project supported by WaterAid Bangladesh to reduce WaSH vulnerabilities in the arsenic affected areas of Munshiganj district. Our approach is based on the formation of Community Based Organisations (CBOs). This has to be done with great care, to ensure participation of people that are normally marginalised.Shologhar and Birtara unions (the smallest local government structure), nine CBOs have been formed (per union) on the basis of smaller so-called “ward” areas. The first CBO was formed on October 3rd, 2013 at ward-3 in Birtara union. The last one was formed in May 2014. Here, you will find an example of a report about the CBO formation.